Growing: Easy to moderate Positronicsâ€™ Jack Diesel is the marijuana variety produced when New York City Diesel and Jack Herer were combined. Such combination resulted to a kind of pot strain that can exceed oneâ€™s expectation from a sativa dominant strain. 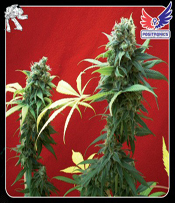 Even if it consist high percentage sativa traits, Jack Diesel has a short flowering time. It has a growth pattern like that of a typical indica plant. In 9 to 10 weeks, buds coated with heavy resin crystals are noticeable. If Jack Diesel is planted inside, complex tones with a hint of floral and fruits aroma can fill the pot area. When Jack Diesel buds are smoked, it can give a relaxing high at first. Then suddenly it becomes intense, powerful and psychoactive in some cases. The THC level is a strong 22% so an extreme high can be expected from smoking its fruity-flavored buds. Growing requires the knowledge of the basics in weed growing and a bit of the advanced techniques for maximum yield potential.